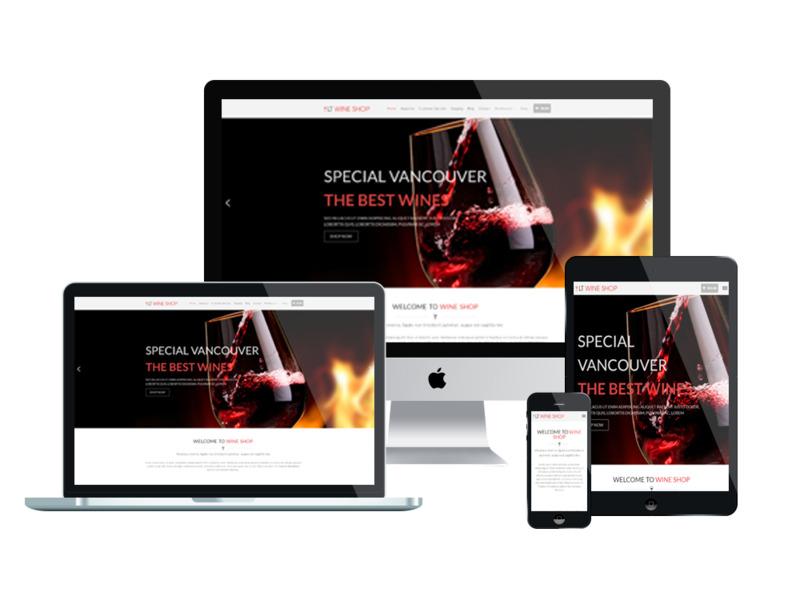 Help you create a simple, user-friendly website that reflects your wine brand then increase your store sale with this amazing Wine Shop WordPress theme! 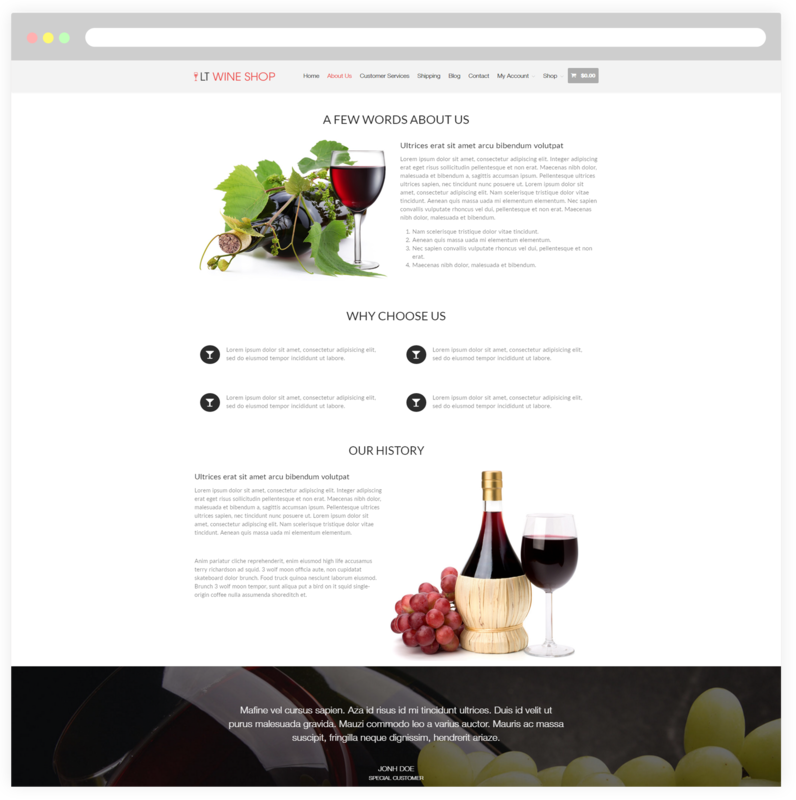 LT Wine Shop is a Responsive shopping cart WordPress theme which is perfectly designed for reflecting your Wine Shop brands! The theme presents luxury wine images, which would be definitely remarkable ways to showcase your liquor store. 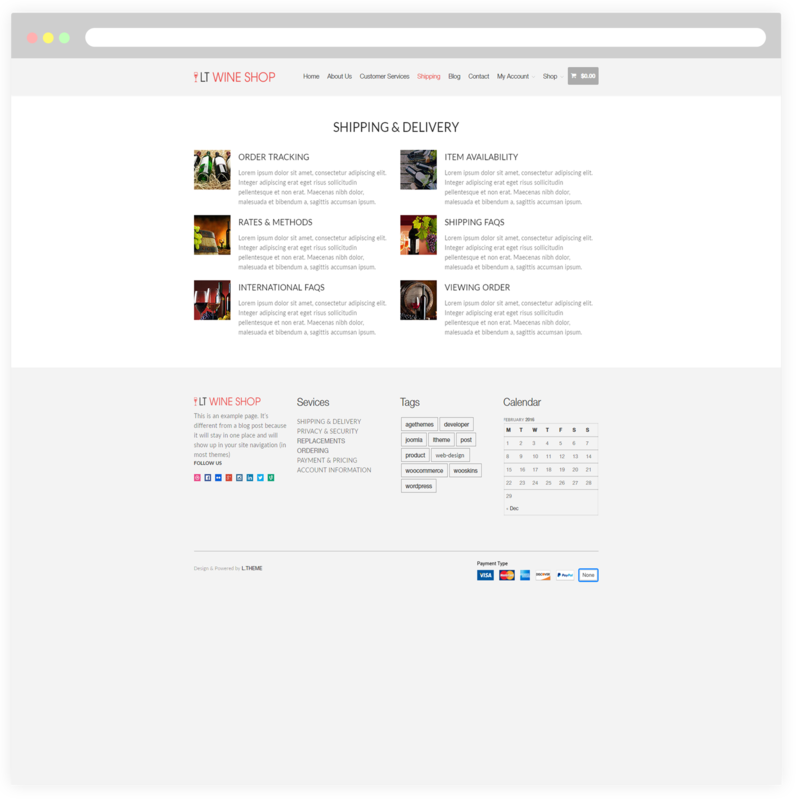 Besides, this theme offers you a good way to increase sale by broadening online business with Woocommerce – a great ecommerce platform, it allows your customers to add to cart and make payment online! 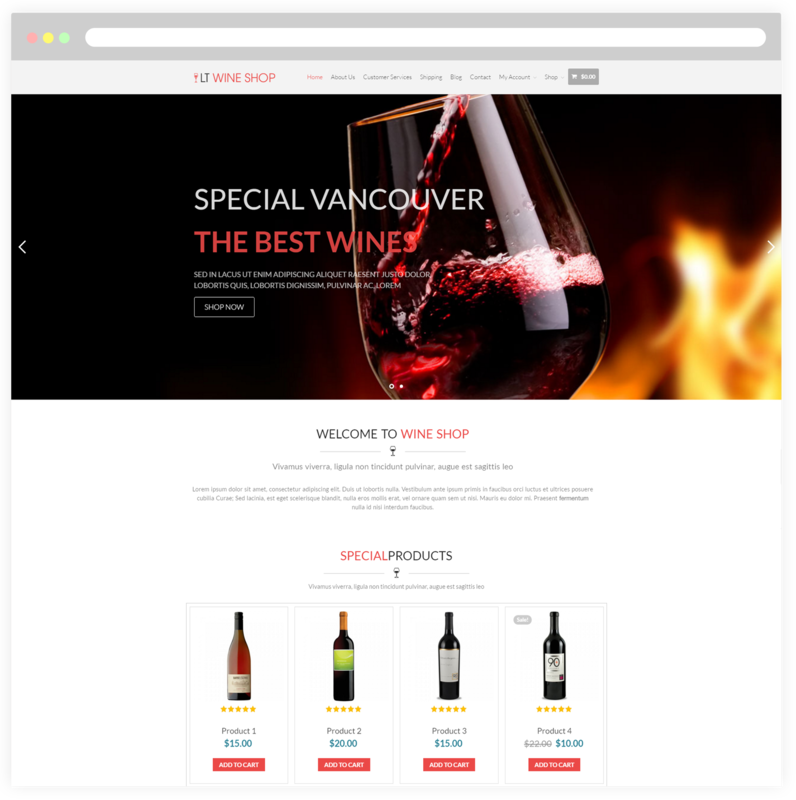 LT Wine Shop has been developed on strong framework with fully bootstrap under 100% responsive layout (fit well on all mobile devices), Bootstrap CSS & Genesis framework supports strong shortcode, drag-drop layout content, and also unlimited options of color, therefore, your site will be fully customizable. Don’t waste your time looking around any more, come and get LT Wine Shop now! 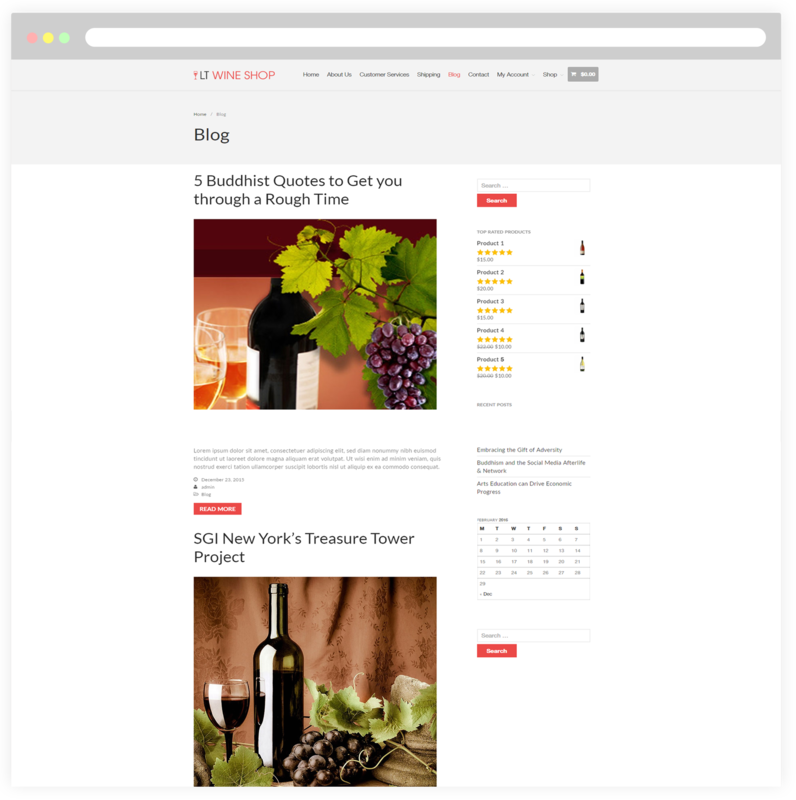 This is a page dedicated to introduce information about your wine shop. Besides, present it’s why choose your shop and history to everybody through this page. 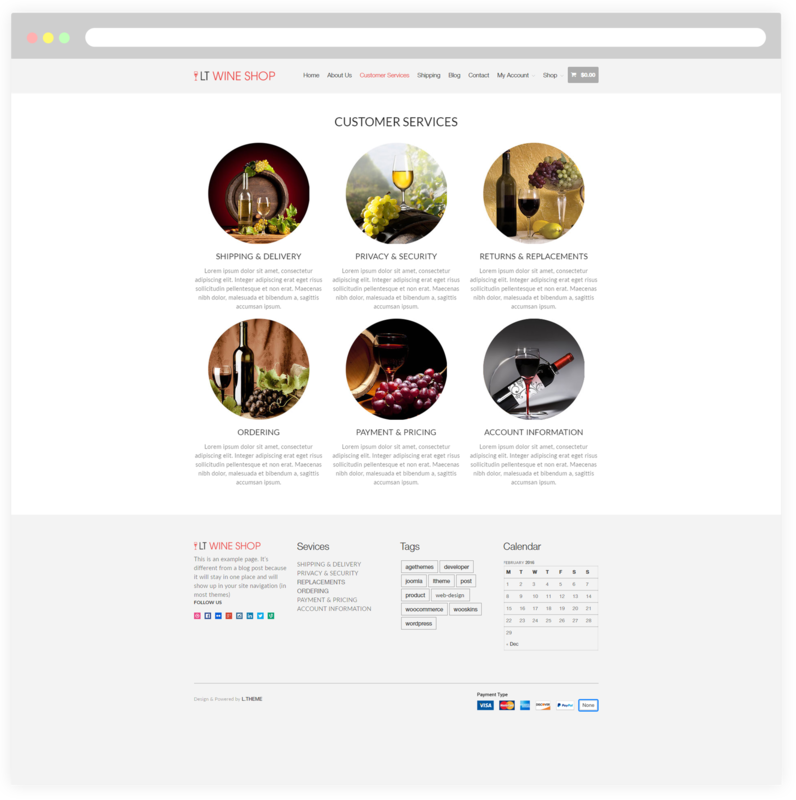 About customer services page of this WordPress theme, you can list your customers services in details such as PAYMENT & PRICING, PRIVACY & SECURITY, and RETURNS & REPLACEMENTS… by using their unique page template. 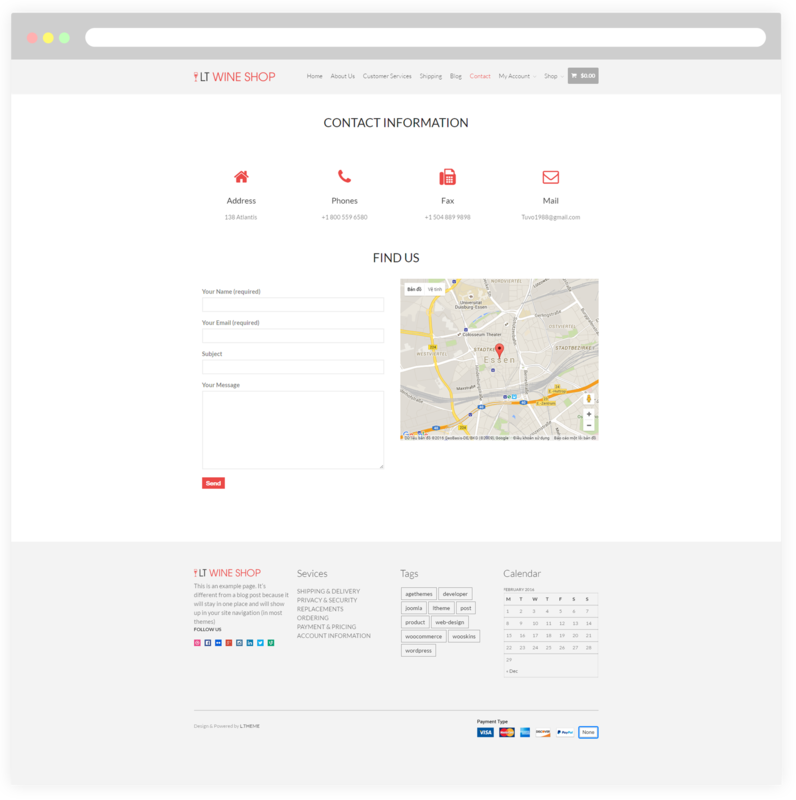 With this page, customers will easily find the location of your shop through address or map. 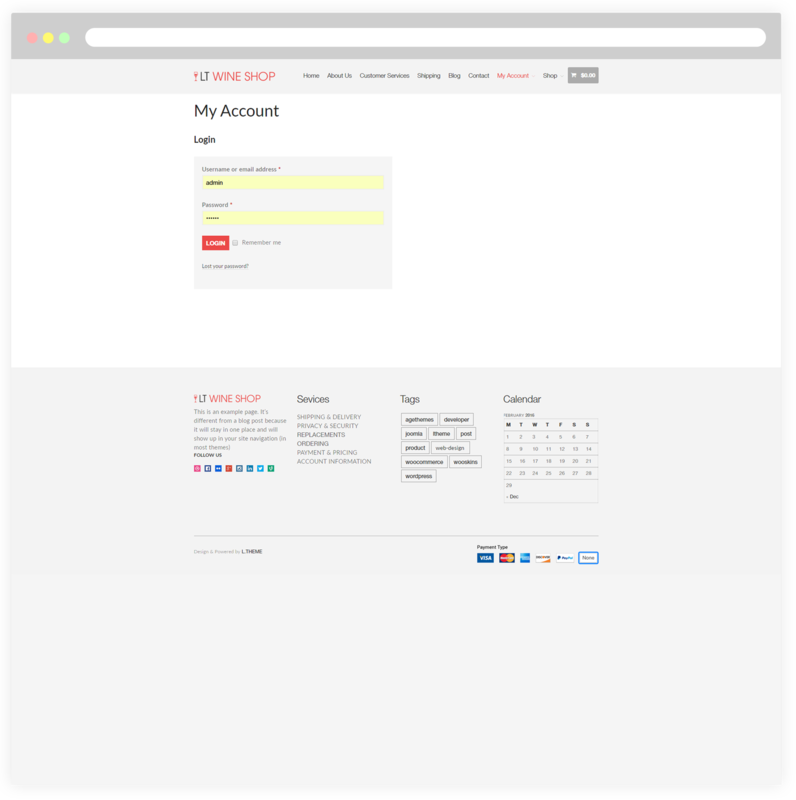 And based on displayed information on website, they can find your shop’s phone number if they need to contact. 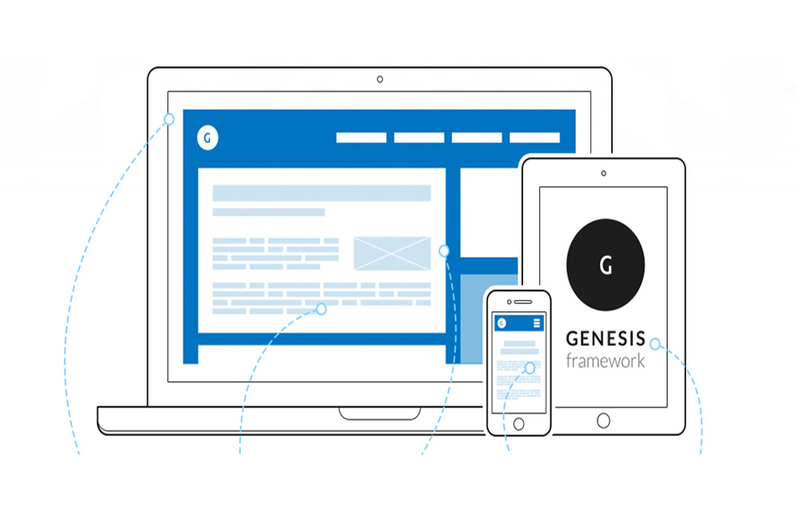 Moreover, they easily send feedback through mail to your shop. 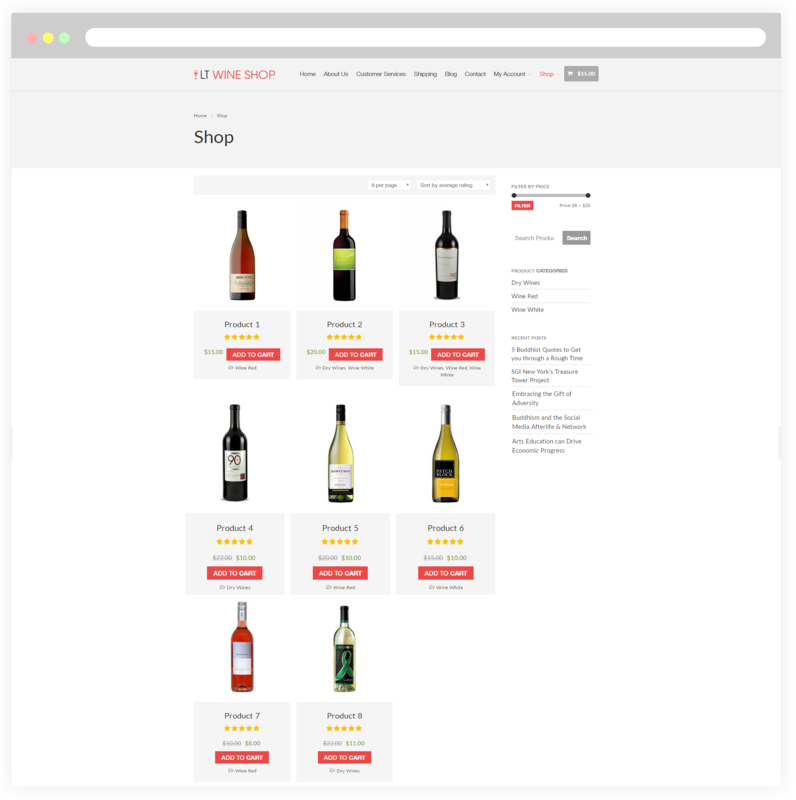 The shop page is especially important to categorize kinds of different wines that are suitable for all cases such as dry wines, wine red or wine white from your shop.